Doctor Blade Chamber End Seals are an essential component for the effective and efficient running of Doctor Blade Chambers. Advanced Supplies offer a complete range of high performance Chamber End Seals to suit all presses and OEM chambers. Our made-to-measure seals, precision cut from high spec’ materials, are designed to outlast the competition and deliver outstanding performance. Our End Seals are specifically manufactured to fit the chamber perfectly, without the need for overloading. 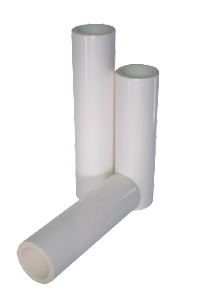 The quality and performance of the adhesive rolls in any elastomer based web cleaning system is vital to achieve the best levels of contamination removal. Advanced Supplies adhesive rolls are manufactured from a carefully selected paper base which is tested for thickness, consistency and profile to ensure a constant high wind quality. The paper is highly moisture resistant to ensure the material remains stable during transit, storage and use. The specially formulated adhesive is designed to work effectively with all elastomer roller based contact cleaning systems. Advanced Supplies adhesive rolls have 70 perforated, easily removable sheets with high adhesive mass which ensures maximum cleaning performance with 2-3 times the effectiveness of competitive products. 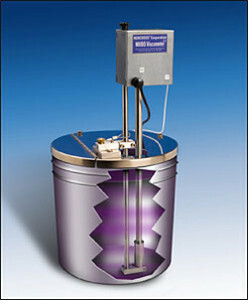 The SHELL CUP VISCOSITY CUP is a simple, reliable device for measuring the viscosity of a wide range of fluids. Superior to the Zahn Cup Viscosity cup because of their sensitivity and because they do not “dribble”, Shell Cups Viscosity Cups are available in eight different sizes for viscosity ranges from 0.3 to 7000 cps (cps = Centistokes x S.G.). Santoprene “long-life” tubing is Advanced Supplies first choice peristaltic pump tubing. Santoprene is a thermoplastic elastomer tubing designed to offer chemical resistance equivalent to Neoprene and is resistant to a wide range of solvents and chemicals as shown in the table below. Advanced Supplies now stock a full range of Tresu EPDM chamber end seals for water-based and UV inks and coatings. Available in sizes D2, D3, D4 and D5, the Tresu range of end seals are widely used in offset printing in the coating units of Komori, Heidelberg, Ryobi, Roland, Mitsubishi and KBA presses. 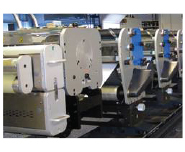 Increasingly Tresu seals are also being used in flexographic label printing presses such as Nilpeter. Why not give us a call on 01257 424231 or email us at sales@advancedsupplies.co.uk to request some free samples. We guarantee we won’t be beaten on quality or price! Most sizes are in stock and can be dispatched for next day delivery. Click the button below to request your free samples. 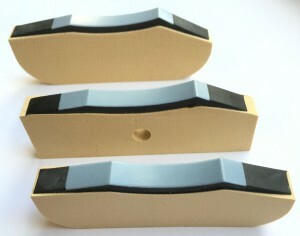 New W&H chamber end seals for increased durability!! 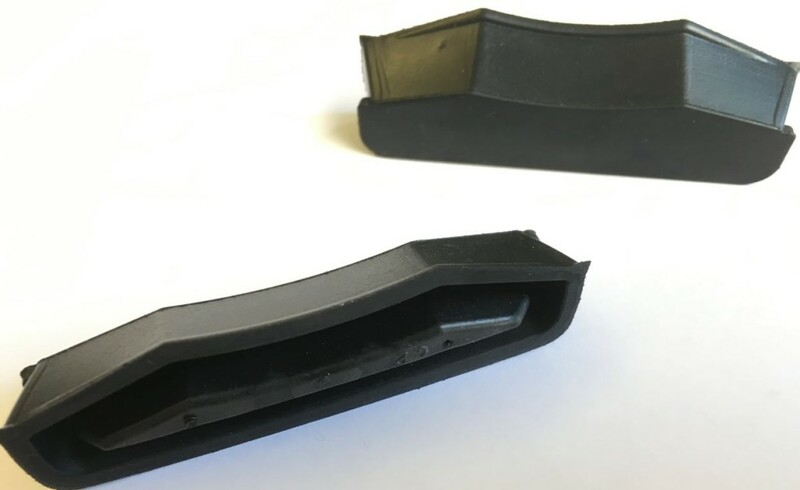 Advanced Supplies recently announced the launch of a new range of W&H doctor blade chamber end seals developed to address a problem that many flexo printers deal with every day; leaking ink. Ink leakage and the mess that it creates is one of the biggest causes of press downtime, not to mention the cost in waste ink that cannot be recovered. The new end seals feature a patented, bonded Telfon strip designed to protect the seal radius (the most critical part of any end seal) and reduce the wear caused by anilox rotation, thereby greatly increasing the time between seal changes. In addition, the enhanced seals allow for much higher press speeds of up to 1000mpm. Don’t take our word for it. Drop us a line with details of your press and we’ll immediately dispatch a sample set of seals. The new end seals are now available for W&H Miraflex, Novoflex and Primaflex presses and can also be custom designed for most other commonly used flexo presses. Unilux Inc (stand 4C68) will introduce six new LED and LED-UV strobe lights at Labelexpo Europe 2015. The new models complete a full offering of LED-based stroboscopes that combine brighter output, more efficient operation and reduced maintenance. This LED technology replaces xenon-based lights that have been the foundation of inspection solution strategies for decades. Unilux will be introducing three new sizes of its highly versatile handheld H2L Series LED strobe: the LED-9, LED-27, and LED-36. 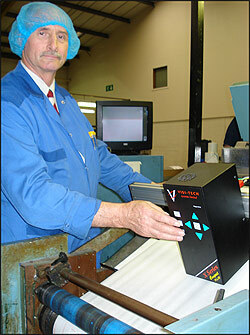 These allow label printers and converters to clearly view printing and slitting quality anywhere on the press. 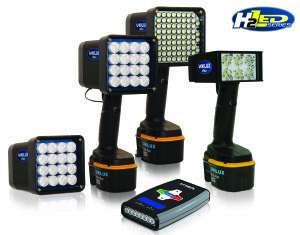 The new sizes are in addition to models introduced by Unilux earlier this year, the LED-1, LED-3 and LED-12, further expanding the range of coverage available in the H2L Series of handheld LED strobes. This new generation of LED strobe lights provides brighter illumination than the xenon-based technology, as well as lower cost of ownership by using only 35 percent of the power and eliminating lamp replacement and downtime caused by lamp burnout. The expected lifetime of the LEDs is 8 years plus, rather than 6 months for xenon-based units. LED designs also operate at cooler temperatures and emit no ozone gas. Unilux will also be showcasing its UV line of strobes, the only source for LED UV inspection lighting. By using LED diodes instead of UV filters which go over the lenses of xenon-based strobes, Unilux is able to make the lights 10 times brighter than comparable xenon lamps, eliminating the need to build special inspection stations where ambient light is a factor. The combination of brighter light and greater choice of sizes, including battery-powered portability, lets printers inspect product wherever it’s most efficient for their operations. Also on display at the Unilux Labelexpo 2015 booth will be three sizes of its fixed-mount LED2000 for real-time surface inspection across the entire width of the web. 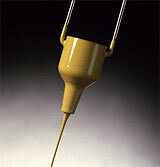 A simple, sensitive and rugged tank mounted viscosity sensor for use with inks, adhesives, coatings, chemicals and paints is now available from the Norcross Corporation via UK agents Advanced Supplies Limited. The Norcross MXBO Viscosity Sensor uses the proven “piston time-of-fall” method for measuring viscosities from 0.1 to 100,000 CPS and is PLC compatible for use with a customer’s process controllers. Suitable for water and solvent-based applications with open tanks between 10” and 24” deep, this sensor is unaffected by level or turbulence for high or low mix conditions. Featuring all stainless steel wetted parts and open rod construction; the Norcross MXBO Viscosity Sensor is easy to clean and works under atmospheric pressure. Capable of detecting the difference between the viscosities of boiling water (0.284 CPS) and ambient water (1.06 CPS), this sensor requires 40 psi dry air, a 3-way 24 VDC air valve, and is furnished with a 2 meter cable. Literature and pricing are available upon request. Manchester based specialist extruder, flexographic printer and converter Duo Plastics had been using a variety of double diaphragm and centrifugal pumps on their flexo presses for a number of years. Faced with having to carry an ever-increasing number of spare parts for a growing range of models Print Manager, Frank Taylor decided he needed to source a reliable, affordable alternative, which would cover most of his pumping requirements. The Internet led him to Wigan-based Advanced Supplies who market the Liquid Flow range of pumps from AB Kelva of Sweden. The Liquid Flow pump is unique due to a number of key design features and, unlike a conventional double diaphragm pump, is ‘stall-proof’ and has a very low pulsation making it ideally suited to printing with doctor blade chambers. What also appealed to Frank was the very small number of parts used to make the LF pump which meant the likelihood of having to carry fewer spare parts and also the fact that the diaphragms can last 4 or 5 times longer than those of conventional DD pumps. The Liquid Flow pump is available in 4 sizes from 15 litres per minute up to 120 litres per minute and is suitable for virtually any liquid. Flexible food packaging printer and converter Sabre Triad, recently purchased their second Visitech video web inspection system. 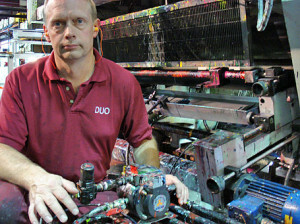 Their first system, purchased in 2003, was installed on a 6-colour Arsoma flexo press running both water and solvent-based inks. Four years later the Preston based company needed to replace a failing 10-year-old inspection system on their 4-colour Timsons flexo press. Faced with options from a number of web inspection system suppliers, Sabre Triad decided to look no further than Advanced Supplies. “One of the main advantages of the Compact Plus system is that the camera and control module are housed together in one unit making for a very neat and simple installation particularly on a narrow web press where space is limited. The system is also very quick and simple to set up and has very user-friendly and intuitive on-screen menus. In addition to that, our first Compact Plus system has given us no problems with reliability in the 4 years that we’ve had it. David McNamara of Advanced Supplies has always been very helpful in enabling us to select the right inspection system for our requirements”. The Visitech X-Series Compact Plus system is one of a number of inspection systems available from Advanced Supplies Ltd.